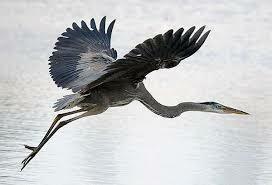 Nothing looks more like a cousin to the Jurassic's pterodactyl than the heron. They have a tremendous wingspan, awkward-looking legs, and a beak that comes straight from their ancestors. To me, they are the rulers of Maryland's waterways. They also have tremendous totemic messenger significance. The Great Blue Heron is indigenous to the Americas (north and central), although other heron species can be found all over the world. 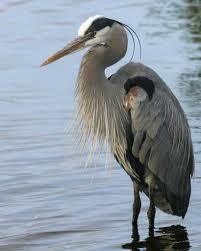 Herons can get as tall as 4.5 feet, with wingspans as long as 6.5 feet. They live near swamps and marshlands where they literally stalk frogs, reptiles, fish, and small mammals. The males gather materials for nests, while the females construct them. 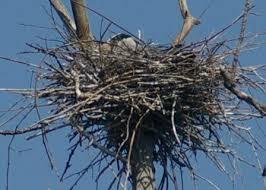 It can take anywhere from 3 days to 2 weeks for the nest to be completed. What if heron crosses your path, but isn't your totem/medicine? Heron's messages are powerful, and they definitely warrant attention. Heron is the representative of aggressive self-determination. When herons fly by, it's time to reflect, go deep, and find that inner fire that fuels you toward your goals. Heron also teaches you patience. By waiting for the right time to strike, you will ensure the accuracy of 'hitting your target.' Heron is one of the supreme hunters of the waterways. Water represents our emotions, dreams, and personal power. As master of this element, Heron can teach you how to master each of these through intuition, meditation, and self-love. Heron also comes to those who need assistance with grace and majesty. Majesty, in the sense of carrying ourselves with dignity and pride in ourselves and seeing our true worth. 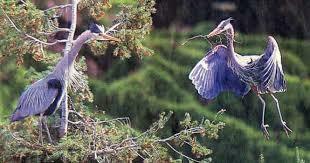 By watching the heron's behaviors, one can translate those into human action. Heron is also a gentle guide to those who walk between the worlds. Heron assists in emotional stability, and creating a safe environment for the walker. 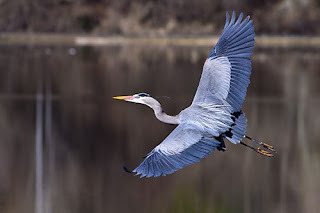 If the Great Heron flies by you today, take a moment to reflect on where you are in your spiritual journey. Are you being self-reliant? Do you feel a sense of pride and dignity in who you are and what you have accomplished? Are you 'stalking' your opportunities by patiently waiting to strike when the time is right? Are you being called to dive deeper into your spiritual journey? Heron is here to help. If you'd like to find out more about totems, or would like assistance in finding yours, please see my Totems section at the top of this page, or select Shop in the same location.